I’m chatting with Vincent Ng, president of MCNG Marketing and author of Pinterest to Profits with Pintalysis about how to use interests on Pinterest. Vincent was the first person I reached out to when I was trying to build my business, and I immediately felt completely understood as a Pinterest manager. Vincent was a speaker at Social Media Marketing World in April of 2016, which was where I first met him in person. His talk there on how interests work with Pinterest peaked my curiosity and figured the podcast was a great place to chat about the topic. As a resident of Vancouver, Vincent was living square in the middle of “the land of HootSuite”. He was working in social marketing, but when Pinterest got started he realized that nobody was really focusing on it. It was the visual aspect of Pinterest that initially drew him in, but knowing that Pinterest had gained 10 million viewers more quickly than any independent site in the U.S. really got him excited. He loved the way that Pinterest drove traffic to sites, and he believed that the site had great potential. So far, he hasn’t been wrong about that! In the early days of Pinterest, you had to wait to be invited to even join the site, and then when you signed up, you were given a list of suggested people to “follow.” That’s why you now see Pinterest users with follower numbers in the hundreds of thousands or even in the millions. Seeing numbers like that can really put the pressure on a new user to reach that same level in a short amount of time. But that is not realistic. As a matter of fact, neither Vincent nor I have met one single person who has built that kind of following in a matter of 2 or 3 years. It just doesn’t happen that way anymore. Nowadays, instead of suggesting that you follow certain people, Pinterest suggests topics. For example, some topics might be travel or fashion. And until you are following specific categories, you won’t be able to use Pinterest to its full potential. We need to understand that by following only certain users, Pinterest loses a lot of advertising dollars. And because Pinterest is a business, they are going to do things in the way that makes the most sense business-wise. So then the question becomes, how do we use interests to develop our own Pinterest platform? And how do we begin to understand exactly what interests on Pinterest even are? Interests are general topics, not curated by one specific person, but generated by Pinterest itself. You need to pick the interests that are relevant to your audience. Go to Pinterest and click on the 3 bars in the top right corner and choose a category. Choose a tile from the displayed results to see how many followers that specific interest has. Your Pins can be seen by those people who follow the specific interest that you are targeting, even if they don’t follow you personally. By naming a board after a particular interest, you can increase your chances of being seen by however many people are following that interest feed. In the case of travel, that can be millions of viewers. Keep in mind that the more followers an interest has, the more competition there is to gain some of those followers. For instance, lots of people name one of their boards “Travel”, so the competition is huge. You want to be very specific in using interests in order to rank higher in the interest feed. You should be niching down as far as possible to reach your target audience. And you need to check the engagement in the interest you want to use. Scroll down a few times, select a few pins to look at, and look at the recent activity on those pins. Is the repin activity high on the pins over the past 3 days? For example, if you click on the 3 bars at the top right corner and choose Travel, then click on Beach Travel, you can see that the topic, or interest, of Beach Travel has 288,000+ followers. Naming one of your boards “Beach Travel” gives you a much higher chance of being seen by the people already following that particular interest. If you have rich pins enabled, then when someone clicks on your Pin in an interest feed, they are also given the option to follow you personally. Pin descriptions are not as important as board names for the interest feed. You do still want to write a beautiful, organic description though, because you are potentially exposing your Pin to a lot of new people! If people really start to engage with your Pins, then Pinterest will continue to show them in the interest feed. So you want to have descriptions that are keyword rich, without being keyword stuffed, and that entice people to click the Pin. Naming your boards after interests is a great way to get exposure no matter how many followers you have. Should You Go Wide – Or Niche Down? If naming boards after interests is such an awesome idea, then shouldn’t you just have a bunch of boards named after popular, well-performing interests that you fill with relevant Pins? In other words, should you have boards that will help you rank higher in interests, and therefore will theoretically get you more followers? Should you have a recipes or beach travel board if you blog about hairstyles? Is the goal to get more Pinterest followers instead of reaching people who are interested in your actual business? Going too wide doesn’t serve the purpose of your audience. You are looking for engagement, not followers. So having boards that don’t resonate with your target audience can mean less engagement with your Pins, and less engagement over time means that your Pins show up in their feed less. Check your Pinterest analytics and see if people are engaging with your profile. If you notice your follower growth is increasing, but your engagement levels are plateauing or even decreasing, then you can see that using a “wide” strategy isn’t working. One way to find possible interest categories you can use for your target audience is to go to Pinterest, type a slash, and then the word “explore”, followed by a slash and then the keyword you are looking for. Using our travel example again, you would type in https://www.pinterest.com/explore/travel/ to get ideas for boards in the travel interest section. The Pins that show up in the interest feed are not necessarily the newest things to have been Pinned. The interest feed is more about popularity than chronology. Seems overwhelming? Here’s a simple workflow to maximize interests. Look through the categories that match your content. Search the individual tiles within the category to see which ones have a good follower count. You want to keep the follower count at 500,000 or less, simply because trying to compete with those numbers is just too much. Look at the engagement on the ones with good follower counts. Engagement is key. If the engagement is high on the particular interest feed, then people are clicking on the Pins in the feed. Create a board named after the interest. Test the board. There seems to be a preference to show Pins from newly created boards, so Pin your items first. Try to Pin several items at once, so at least one of them is likely to show in the interest feed. Monitor the interest feed. If after 24 hours you see some good engagement on your board, then you know it is a board worth Pinning to regularly. If engagement is not high after 24 hours, give it some time. Vincent sometimes waits up to a month to see if it gains traction. Go into a Pinterest analytics tool like Tailwind and see if the new board is getting a good number of rePins. Pin to those boards regularly to continue showing up in the interest feed. It takes due diligence and a lot of patience, but once you start showing up in interest feeds, you keep showing up, because the interest feeds never stop growing. The interest tool allows the Pinterest user to see what they love and see more of it. It increases your chances of getting engagement over if you aren’t using it. To check the competition for an interest category, you can go to the search function on Pinterest, and using our travel example, type in “beach travel”, and search only the boards feature. This will bring up the people with boards named “Beach Travel”, and will give you a good idea of how much competition there is. Vincent is a great Pinterest marketing teacher. Connect with him more at MCNG Marketing, on Pinterest, Twitter and Facebook. You can also check out his Pinterest course — Pinterest to Profits with Pintalysis. 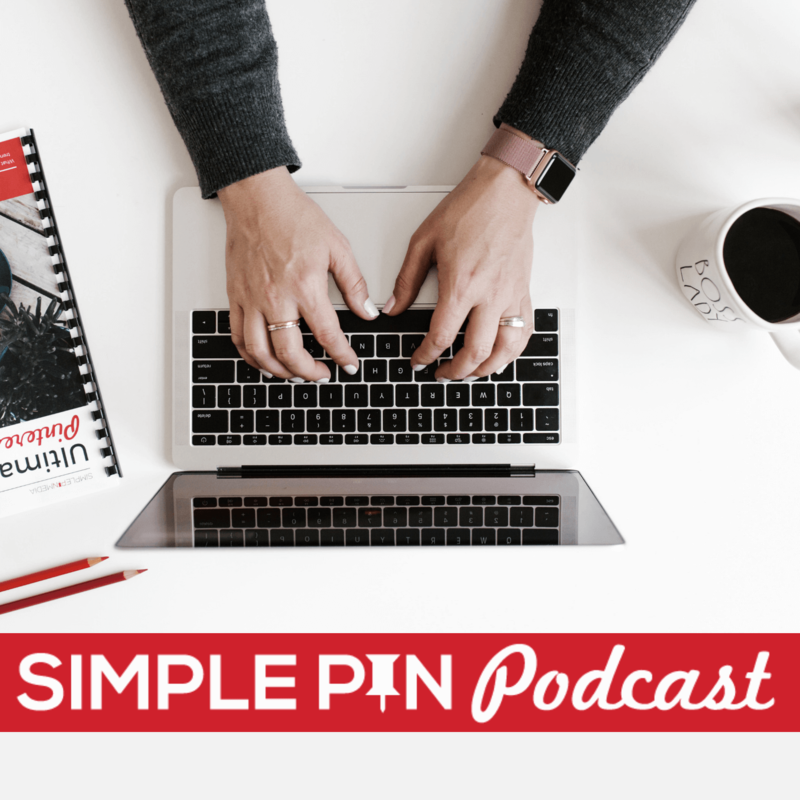 Listen to more Simple Pin Podcasts here. Thanks for all the suggestions! As a relatively new user, it was really helpful for me to get info on all the places I could search for information on Pinterest. The “explore” function was especially useful. I have lots of ideas on how to better name my boards. Thank you! Such great stuff – as always. I’m wondering about my own boards and many don’t have titles like Interests – although they are clear logical board titles. Should I be thinking about changing my board titles – which I believe will also change the URLs – or should I be looking at creating new boards with similar titles and pinning to those alongside my original boards? Some of my boards have been there for years so I’m wary of making changes. Since this post was published, Pinterest has undergone a series of major changes, including the “Follow Your Interests” feature. In recent months, it has essentially been replaced by the “Explore” Feature. To use Explore, click on the circle-shaped icon immediately to the right of the search bar. Is this specifically true of Interest feeds? Wondering if it’s still valid. I’ve definitely noticed that new boards take a while to get the engagement of older ones, and I think Pinterest said something to this effect recently. Thanks! I’m interested in Interests! Haven’t really done anything with this before.